It’s 10:15AM now. Here I am dutifully writing my morning piece, wondering what in the world I can write about that has any meaning at all. I think I need another cup of coffee and my notes. BRB. I’m back and THIS is what I want to write about today! Funny side note, the “Alt Text” on this photo is “person holding a sign.” How funny is that? 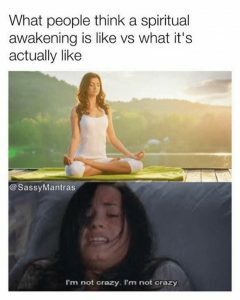 What would you define as a “spiritual awakening”? I liked the first meaning that came up when I googled it. “An Awakening is when the confused and frightened self transcends to a higher consciousness, an awareness full of love and peace.” Hmm…maybe years after the awakening has happened and I’ve recovered from its effects! Every time I’ve felt led to a change in lifestyle, I’m always hit by a wave of fear and stress. It’s like my current practice is a physical part of my body and must be forcibly torn loose before I can adopt a new, possibly better practice. No matter if it’s a spiritual, emotional, physical, or cultural awareness change, from my experience, it is going to cause some stress fractures somewhere, but it will heal stronger than it was once it’s over. That’s what I keep reminding myself. Initially though, as the awareness of a change in thinking comes to me, I am laying there in the fetal position wondering if I have actually lost my mind. Passions. Career. Marriage. Children. Parenting. Education. Religion. Politics. Relationship. These are only a few of the choices we make every day of our lives. And each choice we make changes the trajectory of our lives. The best part is that we aren’t an unguided projectile. When you throw a rock from a catapult, you have to decide where you want it to go and carefully calculate its trajectory. Once it leaves the bucket there is little that will change where that rock land. Its fate is sealed. Human lives are more like a highly advanced space craft. We can leave the ground with one idea in mind, change course mid-flight, and end up where no one has gone before. But we do have to make the decision to change course. That’s where we start to question our sanity. We can see the place we first decided to go. Others have been there before us. It’s settled and has a pre-determined place to land. Mid-flight we see something in the distance, beyond that original destination, and wonder what’s out there. We feel compelled to follow our desires and find out what that glimmer out there is. There are so many unknowns. We may not ever get there. And, even if we did, there’s no guarantee we’d want to be there or want to stay. “This is insanity!”, the safety-oriented part of you says. You have the choice though. Go the way everyone else is and see if you can make it work for you. There’s no shame in that. There is a reason that traditional route is there. It’s safe. Most people are happy on it. You can also travel down the road less followed and find joy there. Or you can be the trailblazer that creates a new way. Everyone has their place in this world. Find yours, even if you feel you may be a little crazy to start the journey. “All the best people are.” says Cheshire Cat.